Brace yourselves, FIFA fans - Microsoft has pulled another U-turn and announced that free copies of FIFA 14 will only come bundled with Day One editions of the Xbox One. This means that the digital download won't be packed in with all European pre-orders as we were previously told, after Microsoft announced the bundle at Gamescom 2013. The word came from Xbox Europe's social marketing manager Graeme Boyd, who announced on Twitter: "Had a few questions on this so wanted to clarify: FIFA 14 will only come free with Xbox One Day One Edition pre-orders, while stocks last.."
Day One editions are much rarer - Amazon has now sold out - so the news has understandably got some gamers pretty annoyed already. 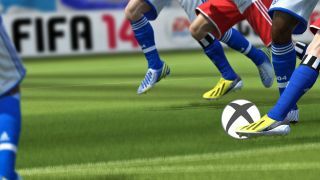 It's currently unclear whether this is a change of policy by Microsoft or whether the original tweet that claimed "All pre-orders come with FIFA 14 in Europe" was an error. Boyd later confirmed that anyone who gets a FIFA 14 download code but doesn't fancy it themselves can give it to a friend. We're not sure that'll be enough to make up for this blunder.